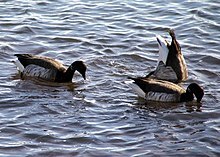 The brant, or brent goose (Branta bernicla), is a species of goose of the genus Branta. The black brant is a pacific North American subspecies. The body of the dark-bellied form is fairly uniformly dark grey-brown all over, the flanks and belly not significantly paler than the back. The head and neck are black, with a small white patch on either side of the neck. It breeds on the Arctic coasts of central and western Siberia and winters in western Europe, with over half the population in southern England, the rest between northern Germany and north-western France. The pale-bellied brant appears blackish-brown and light grey in colour. The body is different shades of grey-brown all over, the flanks and belly are significantly paler than the back and present a marked contrast. The head and neck are black, with a small white patch on either side of the neck. It breeds in Franz Josef Land, Svalbard, Greenland and northeastern Canada, wintering in Denmark, northeast England, Ireland and the Atlantic coast of the U.S. from Maine to Georgia, as well as in a small but significant area, le Havre de Regnéville, centered on the Sienne Estuary in Manche (Northern France). The black brant appears blackish-brown and white in colour. This form is a very contrastingly black and white bird, with a uniformly dark sooty-brown back, similarly-coloured underparts (with the dark colour extending furthest back of the three forms) and a prominent white flank patch; it also has larger white neck patches, forming a near-complete collar. It breeds in northwestern Canada, Alaska and eastern Siberia, and winters mostly on the west coast of North America from southern Alaska to California, but also some in east Asia, mainly Japan. The Asian populations of the black brant populations had previously been regarded as a separate subspecies orientalis based on purported paler upperparts coloration; however, it is generally now believed that this is not correct. It used to be a strictly coastal bird in winter, seldom leaving tidal estuaries, where it feeds on eel-grass (Zostera marina) and the seaweed, sea lettuce (Ulva). On the east coast of North America, the inclusion of sea lettuce is a recent change to their diet, brought about by a blight on eelgrass in 1931. This resulted in the near-extirpation of the brant. The few that survived changed their diet to include sea lettuce until the eelgrass eventually began to return. Brants have maintained this diet ever since as a survival strategy. In recent decades, it has started using agricultural land a short distance inland, feeding extensively on grass and winter-sown cereals. This may be behavior learned by following other species of geese. Food resource pressure may also be important in forcing this change, as the world population increased over 10-fold to 400,000-500,000 by the mid-1980s, possibly reaching the carrying capacity of the estuaries. In the breeding season, it uses low-lying wet coastal tundra for both breeding and feeding. The nest is bowl-shaped, lined with grass and down, in an elevated location, often near a small pond. Branta is a Latinised form of Old Norse brandgás, "burnt (black) goose", and bernicla is the medieval Latin name for the barnacle. The brant and the similar barnacle goose were previously considered one species, formerly believed to be the same creature as the crustacean. That myth can be dated back to at least the 12th century. Gerald of Wales claimed to have seen these birds hanging down from pieces of timber, William Turner accepted the theory, and John Gerard claimed to have seen the birds emerging from their shells. The legend persisted until the end of the 18th century. In County Kerry, until relatively recently, Catholics could eat this bird on a Friday because it counted as fish. ^ BirdLife International (2012). "Branta bernicla". IUCN Red List of Threatened Species. Version 2013.2. International Union for Conservation of Nature. Retrieved 26 November 2013. ^ "UK Brent Oil". One Financial Markets. Retrieved 25 August 2014. ^ "Brant". All About Birds. Cornell Lab of Ornithology. Retrieved 18 October 2011. ^ "Brent Goose". Oiseaux-birds.com. Retrieved 18 October 2011. ^ Jobling, James A (2010). The Helm Dictionary of Scientific Bird Names. London: Christopher Helm. pp. 70, 77. ISBN 978-1-4081-2501-4. ^ Cocker, Mark; Mabey, Richard (2005). Birds Britannica. London: Chatto & Windus. pp. 78–80. ISBN 0-7011-6907-9.